The "prime ant" is an obstinate animal that navigates the integers and divides them until there are only primes left! Edit. you can also use 1-indexed lists, it's acceptable to display the results 1, 7, 10, 275, 513 for the above test case. This is code-golf, so the code with the shortest code in bytes wins. Looping n times in Alice is typically done by pushing a return address n-1 times, then returning at the end of each iteration with k. The last time through the loop, the k instruction has nowhere to return to, and execution proceeds forward. This program uses the same k instruction to stop early when the number is prime. As a result, the final iteration will always move the ant left. To compensate for this bug, we do n+1 iterations on a 1-indexed array, which gives exactly the result we want (and gives the case n=0 for free). Ah, the rare for–else loop! The else clause only executes if the for body is not exited via break. In our case, this means we checked all qs and found none of them to divide p.
This version uses some Octave optimisations so isn't compatible with MATLAB. The code below is a MATLAB compatible version. Uses 1-indexing as with the Octave version. I've tested it against all test cases in MATLAB. As an example the output at 100000 is 3675 (one-indexing). z(i)=z(i)+q(1); %And add on the minimum to the previous. 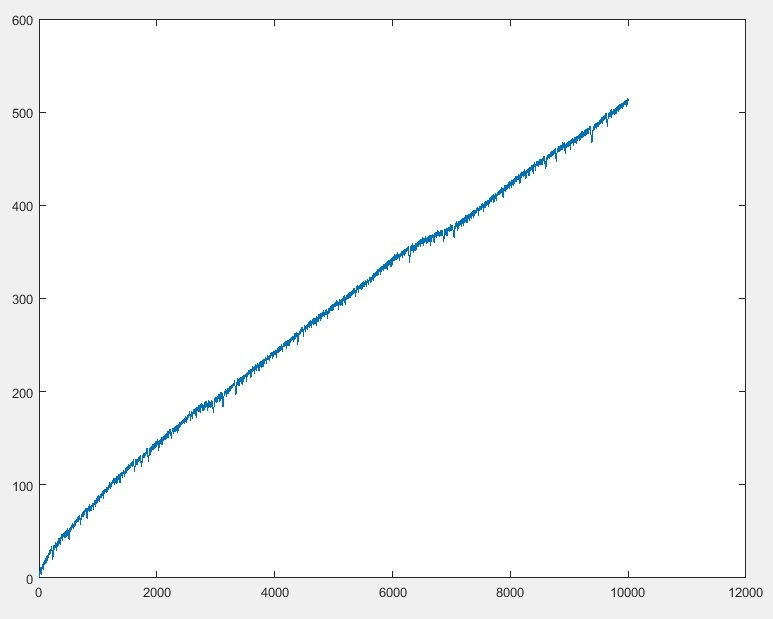 As a matter of interest, this is the ants positions vs number of iterations for the first 10000 values of n.
Seems likely that the Ant will probably tend to infinity, but who knows, looks can be deceiving. NB: You may have to increase the default stack size of your engine to have it pass all test cases. Try it online! Example usage: (#[2..]!!) 10 yields 6 (0-indexed). The function # operates on two list, the reversed front of the array [p-1, p-2, ..., 1] and the infinite rest of the array [p, p+1, p+2, ...]. It constructs an infinite list of positions, from which the nth position is returned given an input n.
The pattern ((a:b)#(p:q)) binds p to the value of the current position of the ant and a to the value a the previous position. b is the prefix of the array from position 1 to p-2 and q the infinite rest starting from position p+1. We construct a list of recursive calls in the following way: We look at each divisor d of p (which is larger than one and smaller than p) in ascending order and add b#(a+d:div p d:q) for each of them, that is the current value p is divided by d and the ant moves one step to the left where d is added to a. Then we append (p:a:b)#q to the end of this list, which indicates the ant moving one step to the right. We then take the first of those recursive calls from the list and prepend the current position, which coincides with the length of the prefix list b. Because the divisors are in ascending order, picking the first from the list of recursive calls ensures we use the smallest one. Additionally, because (p:a:b)#q is added to the end of the list, it is only selected if there are no divisors and p is thus prime. -2 bytes by switching the list of functions from descending to ascending order. -12 bytes thanks to Zgarb's idea to index into an infinite list instead handling a counter, and by switching to 0-indexing. Input and output are stored in Ans. Output is 1-indexed. Output is 1-based. The program times out for the last test case in the online interpreter. The program applies the procedure as described in the challenge. To do so, it makes unusually heavy use of MATL's manual and automatic clipboards. The smallest divisor is obtained as the first entry in the prime factor decomposition. The "divide" update is done by overwriting the corresponding entry of array A. The "add" update is done by element-wise adding to A an array that contains zeros except at the desired position. :Q        % Implicitly input n. Push array [2 3 ... n+1]. This is the initial array A.
" % For each loop. This executes the following n times. 8M    %     Push d from automatic clipboard. f     %     Find: push indices of nonzero entries. Hq    %     Push p from clipboard H, subtract 1. =     %     Test for equality, element-wise. 9M    %     Push p-1 from automatic clipboard. Pretty self-explanatory (not so golf-ish). If you do not count the f(n)= part, that is 82 bytes. You can also start by n-> (85 bytes). It is a 1-indexed language. Saved fifteen bytes thanks to Sherlock9. This is a straightforward procedural implementation with one or two quirks to make sure the code works for all test cases. I use [*range(2,n+9)] to ensure that A is large enough (except for n<3, n+9 is more than enough). The else clause divides the old A[p] by d, decrements p, and then adds d to the new A[p], which is definitely bad coding practice. Otherwise, pretty straightforward. Golfing suggestions welcome! Run as pipe with -R or try it online. Ouch, editing a "state" is not ideal in Clojure. You'll need to increase the exponent for larger inputs. A straightforward implementation. It is provided as a function, which takes the number of moves as input and returns the position p.
It loops over the sequence and moves the pointer forth and back according to the rules. The output is 0-based. A note: in order to find the smallest prime factor of a number x, it computes the modulus of x relative to all integers from 0 to x. It then extracts the numbers with modulus equal to 0, which are always [0,1,...,x]. If the third such number is not x, then it is the smallest prime factor of x. Not the answer you're looking for? Browse other questions tagged code-golf sequence primes or ask your own question. Do we share the prime cluster?